The term ‘phasmids’ (pronounced fas-mids), is just another name for the group of insects we commonly call stick insects. These amazing creatures are so well-camouflaged that they are very difficult to see amongst foliage. The Goliath Stick insect (Eurycnema goliath) is one of Australia’s largest phasmids. It is green with yellow patches on the head, thorax and legs. As well as its wonderful camouflage, these insects have some behavioural adaptations that reduce their risk of being chomped by ever-watchful birds. The insects stay motionless and put their front legs in front of their head to make themselves look more like part of the plant. They usually feed at night and during the day they hang motionless on plants. Even when they do move, they simulate moving leaves as they sway in the wind. When attacked, they spread their wings, displaying the bright red colour underneath, and splay their rear legs apart revealing black eye-like spots at the bases. They also kick out their spiny legs and loudly rustle their wings. These behaviours frighten off predators and work as good defence mechanisms. 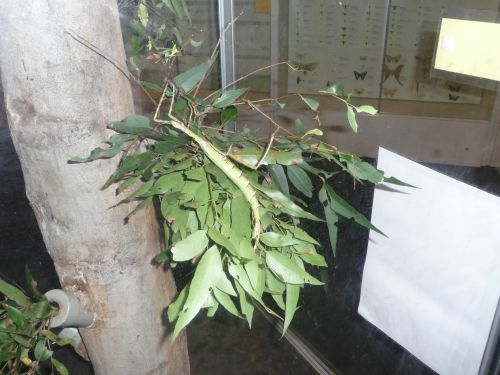 Live stick insects are commonly displayed in the Inquiry Centre on Level 3 at Queensland Museum South Bank. Here is one that stands out under flash photography. Learning about animal adaptations is an engaging activity. A new resource has just been uploaded onto the Queensland Museum website. The content and activities are matched with the Australian Curriculum. It is called ‘Adaptations Teaching Unit’ and is found in the Learning Resources section of the website.